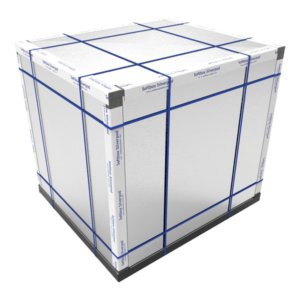 Softbox’s pallet in pallet shippers are used extensively by the Pharmaceutical and Life Science industries, both of which demand temperature-sensitive products to be moved safely and securely around the globe. Naturally, when it comes to shipping drugs like vaccines and other biologics that are derived from living cells, adhering to timeframes and temperature markers demanded by manufacturers are crucial. This is familiar territory for Softbox, and it is the reason why so many leading Pharmaceutical companies opt for the award-winning Silverpod® range of pallet in pallet shippers. Recognised globally, they are a cost-effective way of transporting large quantities of palletised time and temperature-sensitive products. These shippers maintain a designated thermal state throughout transit for up to 120 hours. Innovative and resourceful features have been created to provide a significantly lower price point compared to reusable and active solutions, with no compromise in performance. Simplicity, optimised loading, flexibility with consignments and a single or double pallet option are all contributors. Nowhere is our dedication to keeping our temperature control packaging systems at the cutting edge of cold chain logistics more evident than in our Silverpod® MAX offering. These new additions to our pallet in pallet shipping systems provide updated advances that are highly beneficial to the industry. Silverpod® MAX is our ‘best of everything’ pallet in pallet shipper, one that has all the quality hallmarks of its Silverpod® name, but takes some of the best features from our original pallet in pallet shippers. Silverpod® pallet in pallet shippers continue to live up to their reputation as best-in-class temperature control shipping systems. Designed with the intention of accepting palletised loads, they optimise capacity and integrate perfectly with different global freight networks. Ease of delivery, storage and assembly, using flat-packed components, also help to reduce pressure on your bottom line. 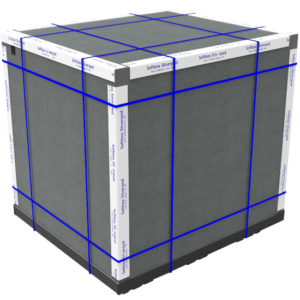 Silverpod® pallet in pallet shippers will comfortably maintain the designated temperature for a range of transport modes and extended durations. They are readily available from our extensive global network.